There’s always those random cards you pick up at random times that don’t quite fit into a post on their own. 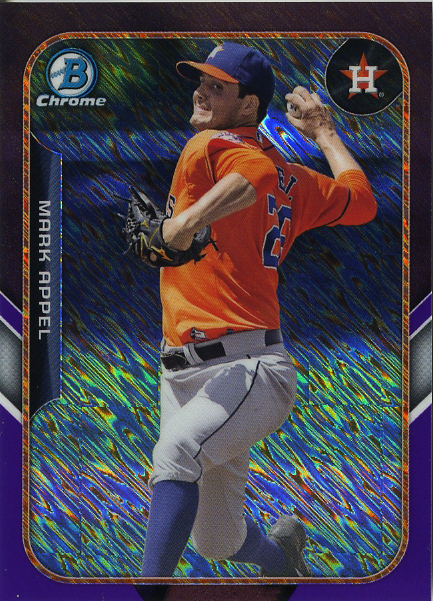 Sure, I could mention how I picked up two Astros cards for no particular reason, but the truth is I just added them on to something else I was buying and I plan on giving them to Sam at some point. Does that entire train of thought deserve it’s own post? Probably not. Am I going to show them to you anyway? Of course I am. lol. 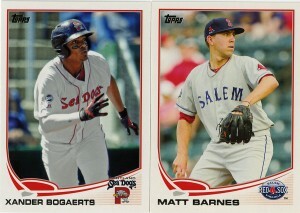 I had been browsing random sellers looking for a few Bowman cards and I ran across these two. 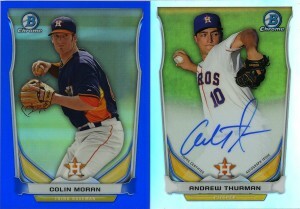 I think the blue is actually /199 or something similar, and refractor autos are always nice. 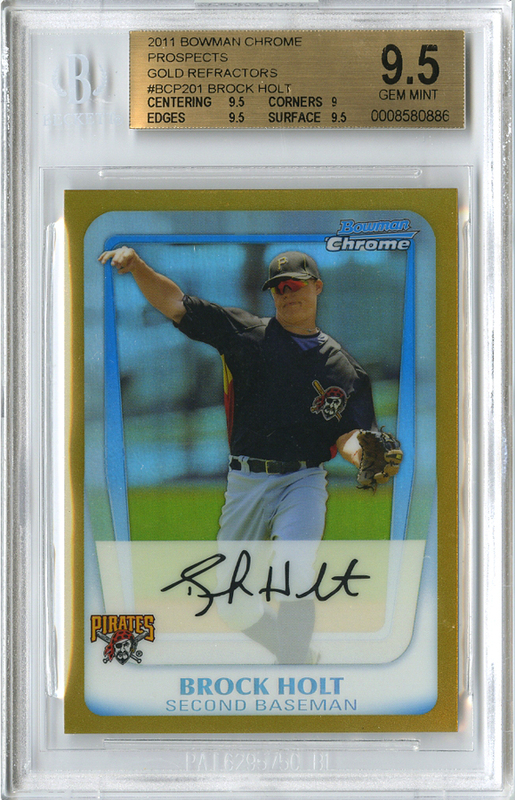 Here’s another card I wasn’t actually looking for, but I thought was nifty enough to add to the basket. 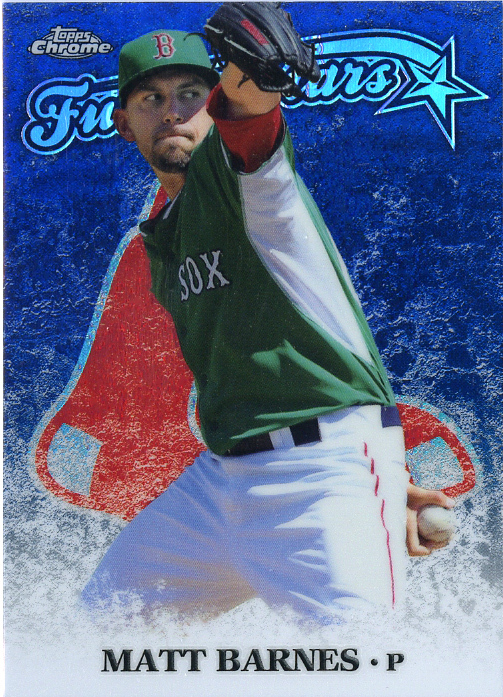 I think the wave refractors were tough pulls, and the colored ones doubly so. There’s the card I was actually trying to buy. 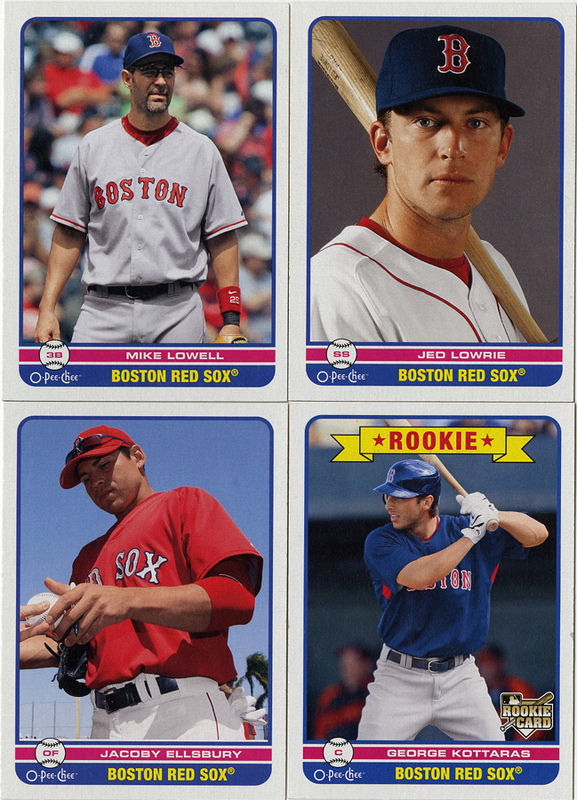 I’m on this kick to try and nail down the important/rookie/quintessential cards for current memebers of the Red Sox. 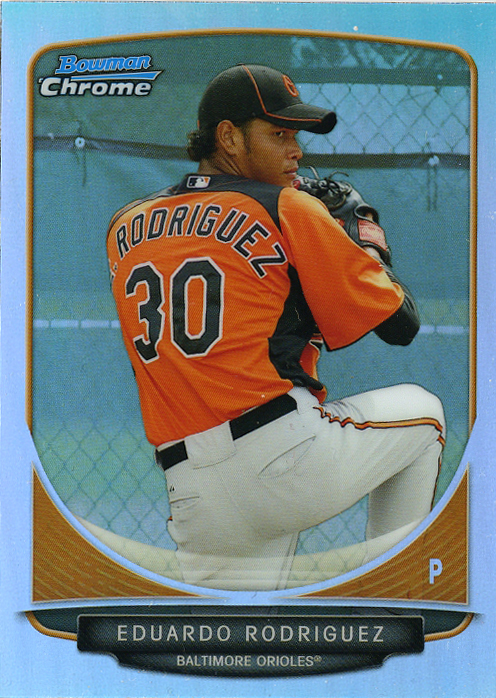 Since Rodriguez factors into the starting rotation for the forseeable future, I figured a Bowman card (before his rookie card) from the minors made sense. I’ve got plenty of his cards from this year with RC logos on them, but I wanted that “first” card as well. 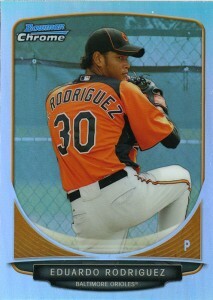 Speaking of random rookie cards. 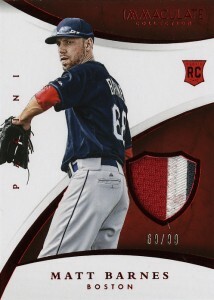 How about a Matt Barnes RC patch card from Immaculate? Not too shabby. 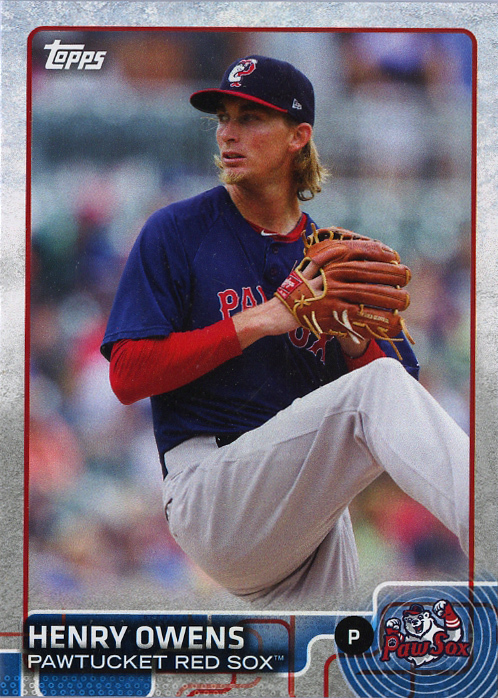 I have no idea if Barnes will work out this year now that they’ve decided to make him a part of the bullpen, but hopefully the reduced innings and more time to perfect his control will be a good combination. Finnegan, who got traded to the Reds in the Cueto deal, was just along for the combined shipping ride with the Matt Barnes. I love it when sellers just jettison nice cards for nothing. 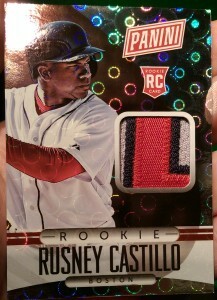 I have no idea what a box of Immaculate costs at the moment, but somebody definitely lost a couple bucks on this one. All the better for me. Trade bait if anyone wants it. Now, that’s a pretty nice pickup if I do say so. I already had a Gold border 2011 Bowman Chrome, but this one is graded. So, now I own 2 of the 50 copies of this, and the only one that’s ever been graded (Population Report). Yay! Last card for today. A very nice Noe Ramirez patch/auto from Bowman Platinum. 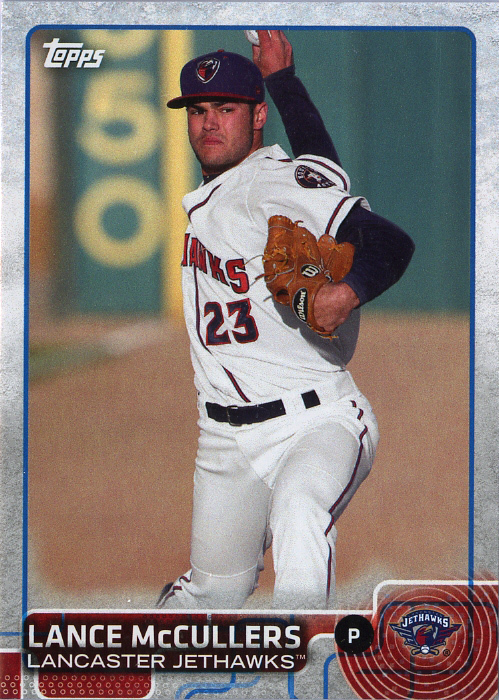 Ramirez spent most of last year in AAA but got called up in Septemeber when Tazawa was shut down for the season and spent a month or so as the bullpen setup guy. He looked pretty good in his 17 appearances, with the exception of one really bad day against the Astros at Fenway (hit a batter, 4 runs allowed, etc). If he wins a bullpen spot in spring training he’ll be a good bullpen piece, if not then another year in AAA should give him a bit more experience. Apparently I was on a “bullpen pitcher” buying frenzy and didn’t realize it. In other news, the Houston card show is this weekend. Going to try and hit that and splurge on completely random junk. I’ll be back next week with complete and utter random nonsense. So, does having three Triple Threads give me nine total threads? There’s something about 2015 Triple Threads that just wasn’t really working for me. The background sort of looks like Inception, or Museum Collection. The colored parallels are just different colored clouds. At least National Treasures has the decency to change the color of the foil. Then there’s the fact that every swatch is gray/white. 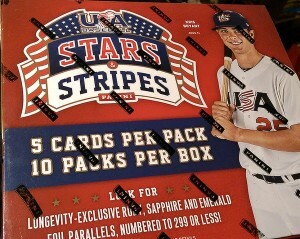 Topps has too many products. At some point they need to cut back. Plain gray swatches in a product that costs $180 a box and contains only 14 cards is pretty unacceptable. 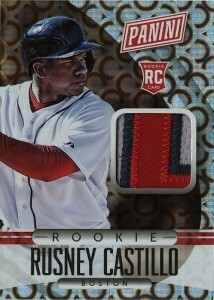 How many products does Topps have at that level that they’re saving all the patches for? Let’s count: Dynasty, Five Star, Museum Collection, Strata, Supreme, Tier One, Tribute and Triple Threads? EIGHT?!?! Eight ultra premium brands. No wonder a patch is hard to come by. I digress. The lot of these three was next to nothing. I think I paid $5, shipped, for all three. I wanted it primarily for the Holt, especially since Nava is no longer with the team, and Castillo seems to be hit or miss so far (no pun intended). Good cards for the collection, but not exactly display case worthy. 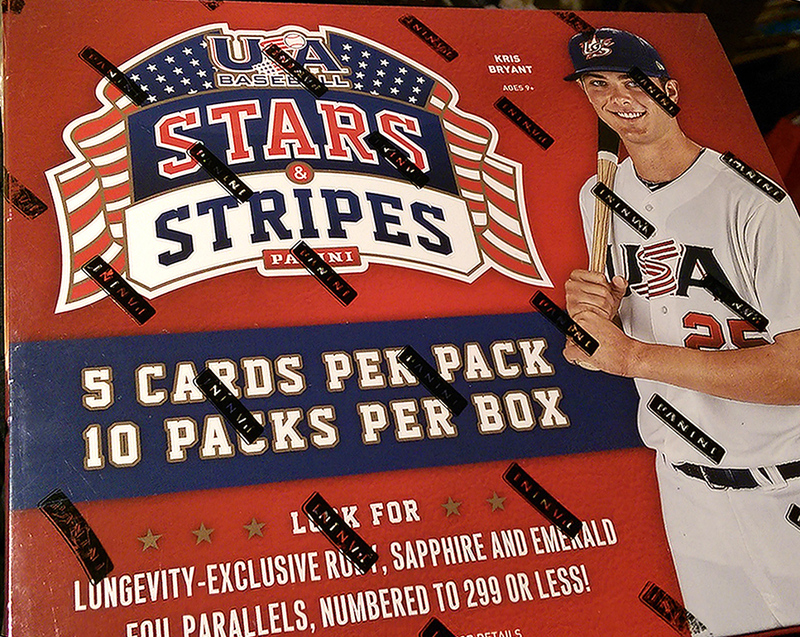 One of my Christmas gifts from my awesome wife was a box of 2015 Panini Stars and Stripes. 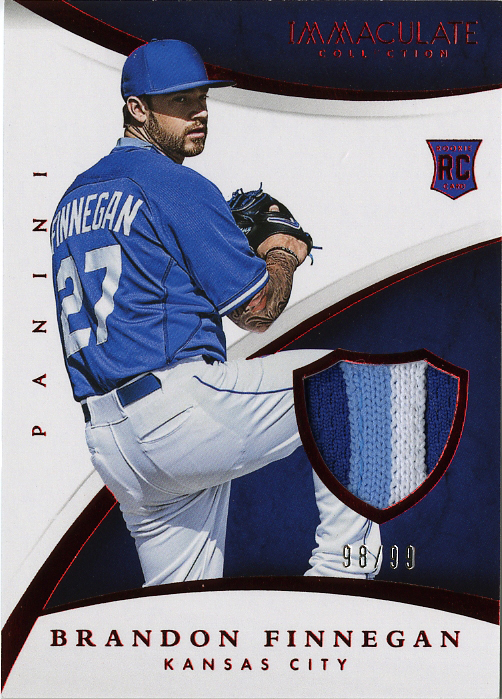 I’ve been a fan of Team USA related stuff for a long time and now that Panini has the license, they’ve been doing some cool things with the brand. The box isn’t very big at 10 packs, 5 cards per pack (50 cards total), but they squeeze in at least 4 hits and a number of parallels. Yes, the players aren’t terribly famous yet, but this is like super-early prospecting, at least in my opinion. Half these guys won’t even get drafted, but there’s a good chance that there’s some early/first cards of eventual MLB players in here. So, let’s see what a box of this stuff has to offer. I was trying to update my “want list”, which has quite a few random base cards on it, and I figured Sportlots would be a great place to finish off those checklists. I’ve ordered several times from there, always with good results. They deal mainly in base cards and everything starts at $0.18. In the past you had to specifically search for a card, but they had just added a feature to browse a sellers other cards after something was in your cart. 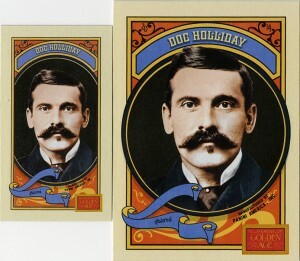 This was awesome, at least for me, because I could add a card to two to maximize my shipping costs. Most sellers would let you add 8-10 cards before the shipping changed. I started with a set I really liked, but was never able to finish: 2009 O-Pee-Chee. I don’t know why I like this one so much, I just do. It just seems old school. It’s still printed on cardboard, it’s got a simple, retro design, and the checklist is crazy deep. 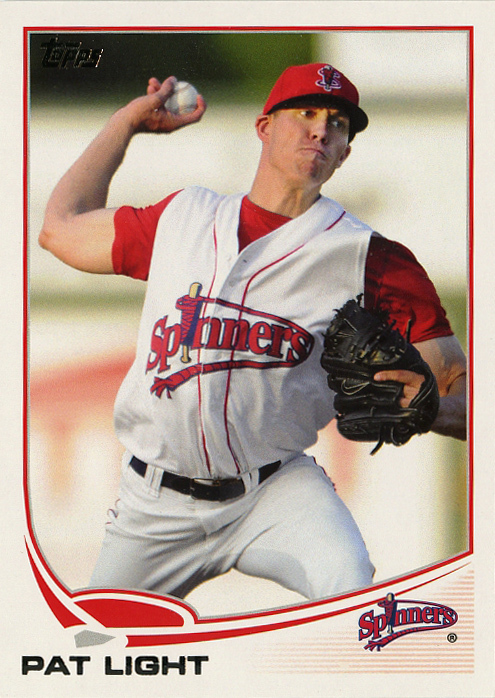 I’m pretty sure there’s a card for everyone on the 25-man roster from 2009, plus a couple others, plus a couple insert sets. I crossed off a huge portion of my list in one big order, but there’s still a few more to find. 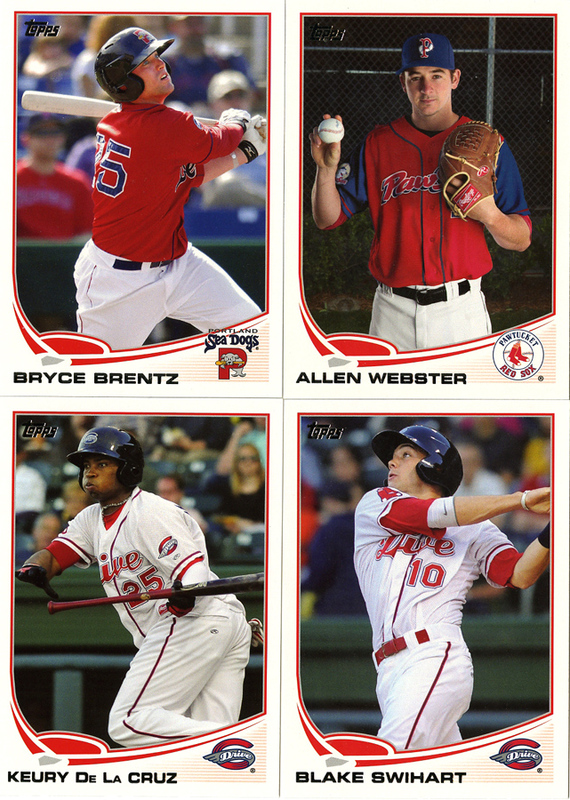 Next, about half the team set from 2014 Pro Debut. I had found the other half at a card show and I felt like the set had a strong enough checklist to try and finish it. There were some pretty recognizable names in this one. Allen Webster, Blake Swihart, Pat Light, Xander Bogaerts and Matt Barnes specifically. 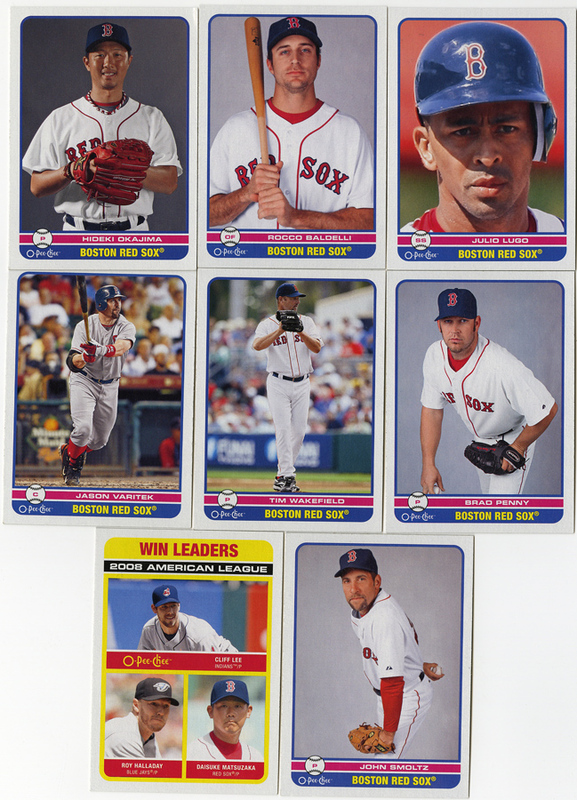 Sorry about the random scans, all these cards came from multiple sellers and I just scanned them as they came in. Just like the 2014 set, the 2015 Pro Debut is pretty solid. Thankfully I had 90% of the set already. 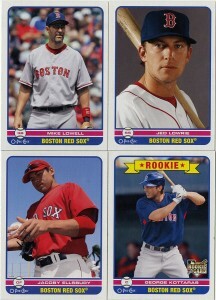 Owens was the last Sox cards I needed, and McCullers was an addon for shipping. I figured it might be fun to try and get it signed here in Houston. 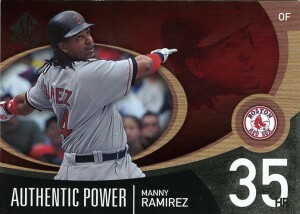 2009 UD SP “Authentic Power”, which, sadly, we can probably all agree isn’t really “authentic”. Don’t get me wrong, Manny had the eye for the ball, and the textbook perfect swing, but I wish he had just hit the gym a little more for his power instead of relying on PEDs. Fun guy to watch, but sad what he did to get there. 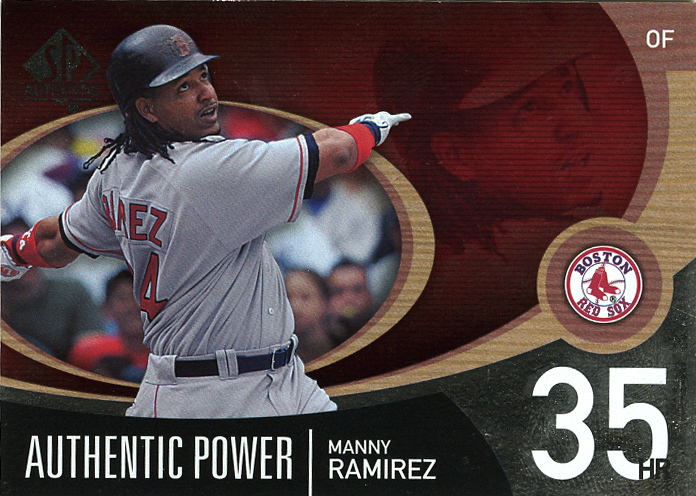 Regardless, still needed the card, and I still collect Manny cards in general. 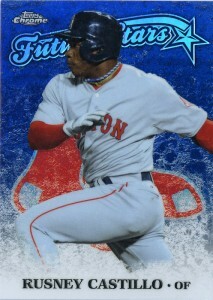 I still need two or three more of these inserts even though I finished the base set years ago. Here’s a couple just for giggles. 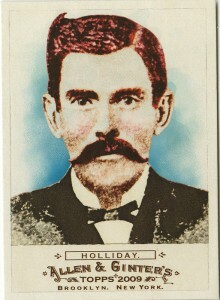 Doc Holliday. I can’t believe I never had either of these. 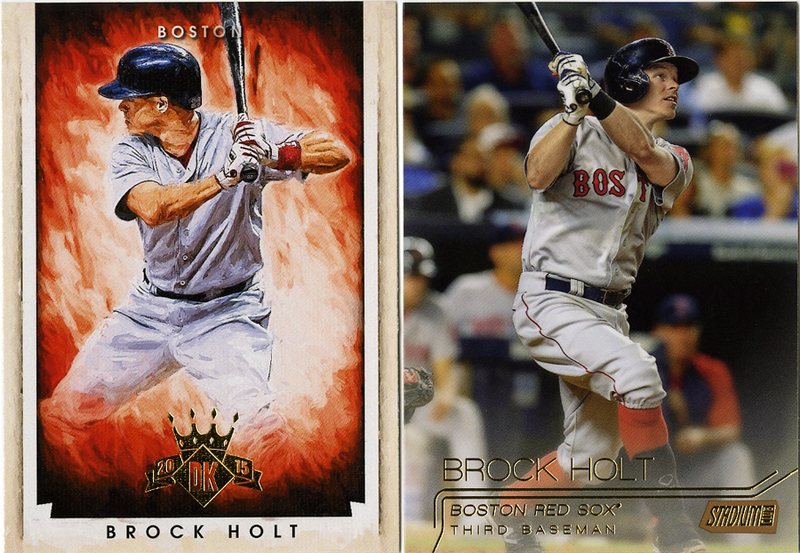 There’s an Upper Deck SP somewhere that I did have, and I believe these are the only two other times he’s ever appeared on cardboard. Not that I expected that number to be higher. “Gunslingers of the Wild West” doesn’t really lend itself to baseball cards. 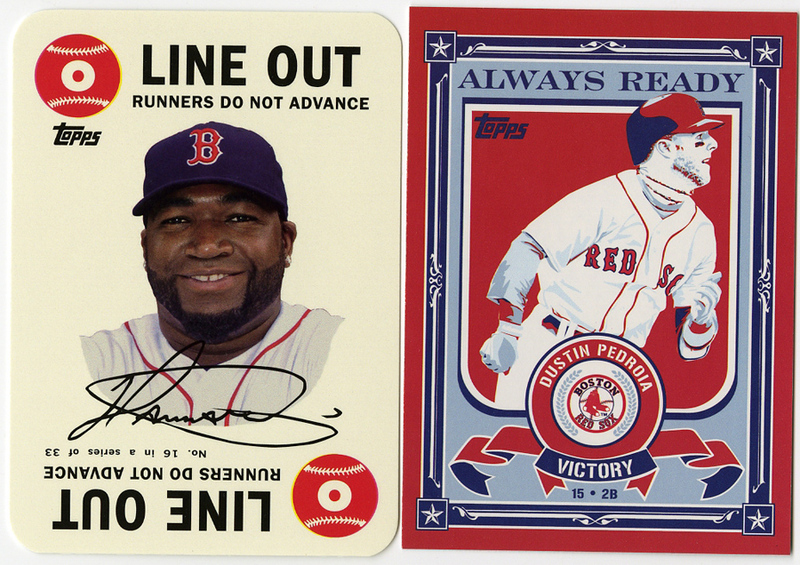 I just figured these would be fun to have in my oddballs binder. Speaking of oddballs, a couple random inserts. I’m not even really sure what sets these were from. 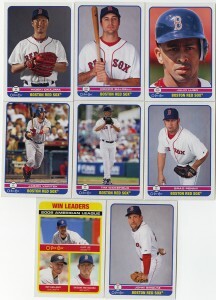 They were add-ons when I searched sellers inventories for Sox players. I’m also not quite sure who’s signature that’s supposed to be on the Ortiz card, his autograph looks nothing like that. A couple Holt cards. The Diamond Kings was just an add on because I only had the one copy (in the team set) and I wanted a second for the player collection. The Stadium Club is a gold-foil version, so I grabbed it just for the sake of it being a parallel that I needed. 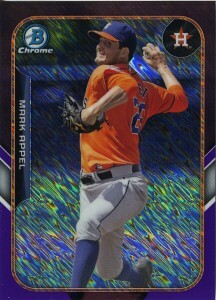 As I mentioned last week, I had changed my tune on Topps Chome. After avoiding it last year, I find myself trying to complete the 2015 set. These are about half the inserts I needed. 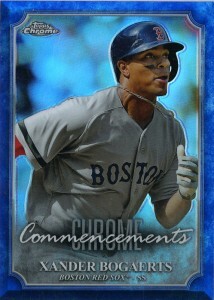 I need one more Chrome Commencement for Mookie Betts, a couple autos, and FOUR “Chrome Culminations” which I’ll never find because they’re apparently “case hits”. How nice. That’s about it from last months Sportlots order. I think everything in here was less than $10, even after shipping. Sportlots is like those dime boxes at a card show… only online. Love it. I figured I’d start off with the card so that it’s clearer what I was actually talking about. I purchased this card back in November, I think. I didn’t know anything about it, what it was from, or how rare it was. It doesn’t have any numbers on it, or any details about the product. The whole thing is trippy and holographic. Believe it or not, I won the card for about $4. Since it’s now in my collection, I figured I’d better find out what it actually was. I started digging and found a post by Panini about a month before than National Convention talking about their VIP party and that the packs they were giving away were going to have all kinds of crazy stuff in them, including something called a “Pyramid Refractor”. That was a start, but these certainly don’t look like pyramids, so I kept looking. “Rookie Memorabilia” and included Pyramids. Castillo was on the list. Getting closer. I was still a little worried that it wasn’t numbered. 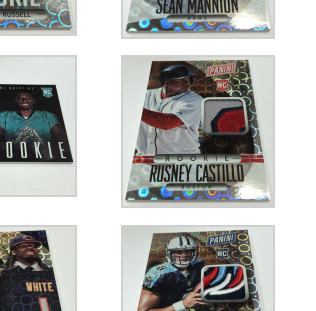 With “rookie memorabilia” and “pyramid” added to the mix, I tracked down a gallery post on Panini’s site about their VIP party “gold packs”. I was let down, there wasn’t any photos of anything that looked like my card. I thought I had it. They talked about their gold packs, mentioned the refractors, but mostly showed off football cards that were completely different. 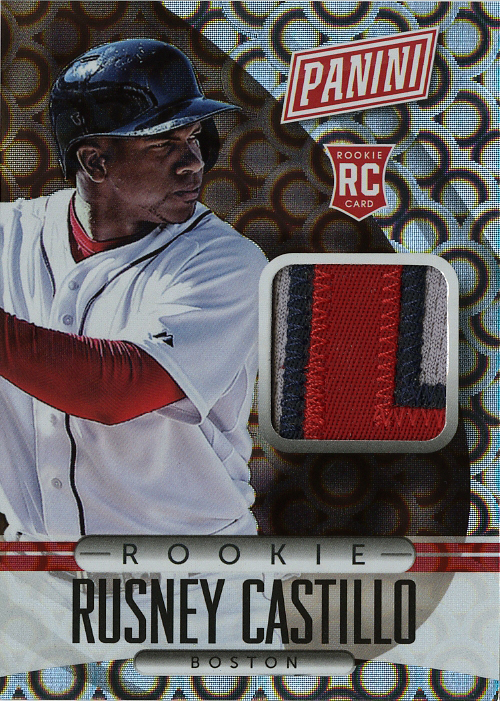 “2015 National Convention, Panini VIP Party, Gold Pack Exclusive, Rookie Memorabilia, Rusney Castillo Pyramid Refractor Patch” of which, only 10 were made. I never really thought it would be from some exclusive VIP party pack. I’m pretty happy it’s /10, even though it doesn’t say it, but I’m just happy to have it in my collection, whatever the heck it’s actually called.